I first met Mark in 1971 soon after arriving in Sydney as a 20-year-old out to see the world. I watched him and his crew, Tim Alexander, work on their superb FD before the 1972 Olympics but was soon after transferred by HP to Melbourne. Four years later I returned to Sydney and sailed Lasers with a terrific fleet off Balmoral Beach. And yes, I sailed with Mark in his first Laser race - a long-distance race to the Opera House and back. Mark switched to bigger boats and won the J/24 and Soling Worlds before returning to Lasers in the 90's. In 1998 Dr. Stuart Walker was asked who he thought were the best sailors in the world. His answer: Paul Elvstrom, John Kostecky, and Mark Bethwaite. Today, Mark focuses on the Laser Master Worlds which he has won 10 times. Competing with Mark is sailing at its best. I guess the LMW in Kingston Ontario last year is the logical starting point for my contribution to Doug’s blog. My preparation for that regatta was not great and was set back further by not arriving in Kingston early as planned to train. Carolyn and I made our way there by boat and were held up by high water levels in the Oswego Canal. I was not really fit, not fast downwind and didn’t start well with two UFDs. Alan Keen (RSA) sailed a great regatta and the points tie between us at the end of the series was (just) resolved in my favour. I resolved to prepare better for Vallarta this year – I was looking forward to a rematch with Alan and whilst that did not eventuate I had seen what Doug could do in his first year in a new age bracket, having won the Masters in Chile in 1997 and Grand Masters in Korea in 2006. Beware the Peckover in a year ending with 6 or 7! I fell back on a proven strategy. Get together a good group of sailors also going to the LMW, engage good coaches, schedule plenty of on water training after work and weekends, get the aerobic fitness up and train hard up to the last minute, fly straight to the LMW and come out of the blocks hard. The four of us from Double Bay SC and Vaucluse YC were fortunate that Brett Beyer had time to coach us for several sessions between his commitments to Olympic aspirants from various nations. 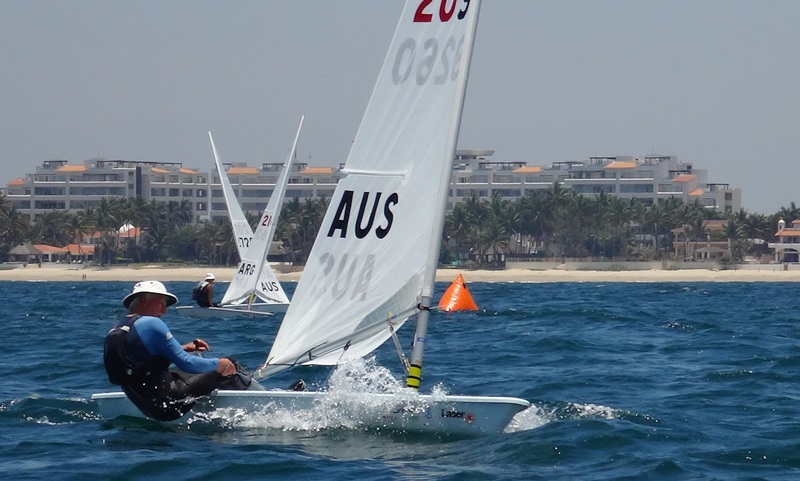 After he left for European regattas then Vallarta, we had Mike Leigh for a number of sessions. Both are great coaches and also diplomatic. The ageing bodies of GMs and particularly GGMs are harder to train than the young, fit specimens they are used to working with, but it is in our head department that coaches find most difficulty. Quite apart from declining eyesight and hearing, we tend to forget what we have learned from one session to the next, so there is a far amount of rework! The fourth element to my training involved plenty of bike work. Nearby is the appropriately named “Heartbreak Hill” in Sydney’s annual City to Surf which attracts over 70,000 runners. On most days during the months before Vallarta I pointed my bike at this hill from Rose Bay to Watsons Bay then again on the way home. This plus near daily on water training closer to departure meant that I was fitter for Vallarta than I have been for some years. One other thing was to have a gym instructor map out a stretching program which significantly reduced my post sailing recovery time. Preparation for a LMW should enjoyable – I think it is important to train in a way which is not only beneficial but fun. I don’t like indoor exercise but I do like bike riding and on water training - others may take a different approach. In Sydney we are blessed with a great Harbour and weather and as the LMW approaches, I really enjoy the feel of the body getting leaner, hands getting harder and the brain clicking into fast mode on the water, reflecting in better results in club sailing and lead up regattas. I was fast enough upwind in Kingston but slow downwind so I really focused on my downwind speed with Brett and Mike’s help. It was great in Vallarta to be quick downwind. In addition to preparation for Vallarta, Doug has asked me to talk about the regatta and my view on the Mark II sail. What was not to like about the LMW and racing in Mexico? Great onshore and on water facilities and organization, clean warm water and sea breezes that filled in each day like clockwork, with waves to slash through upwind and ride fast downwind. Add to that great competition afloat and camaraderie ashore assisted by cold Coronas and margheritas – it was as good as Cancun in 2000 and that is the yardstick by which all subsequent LMWs have been judged – up till now! I have been sailing Lasers now for 20 plus years and having previously shipped Flying Dutchmen and Solings to many overseas regattas, I really appreciate the one design nature of the Laser class which means that you never need ship a boat again. You pitch up with your sail, lines and sailing clothes and are allocated a charter boat. That is until this year when for the first time there was a choice of sail! Having alternated between the Mark I and Mark II sail since the latter became legal late last year, I have formed the view that the Mark II with more built in shape is a higher pointing and better light/moderate sail but the Mark I flattens out and blades off more readily in the head so is lower drag and faster in strong wind. I was a keen student of the wind reports from all three regattas at Vallarta preceding the “main event”, the Standard Masters Worlds. The result was that racked by indecision, I pitched up at Vallarta with both sails! My Mark I sail has now won three Worlds (Oman, Hyeres and Kingston) and has a race winning percentage at that level well over 90%. I joke that I keep it in cryogenic storage between Worlds, and that is half true! Certainly I always feel very confident with it. I used that tried and trusted Mark I on the day before the practice race and was happy enough with my speed. Then for the Practice Race in a combined GM and GGM fleet in 10-14 knots of wind, I used the Mark II. I started on Mark Bear’s (USA) hip, lifted off him (which gave me great confidence as in similar conditions in Hyannis in 2002 he had beaten me to a pulp), was third to the top mark, second to the bottom and then drew away to win the race by an “Australian country mile”. My sail selection decision was made! That was the last time we raced as a combined fleet as the GGMs wanted a “gentlemen only” event and the GMs wanted no more of us either! I have read and concur with Brett and Gavin’s observations on the Mark II sail. With greater built in shape, the adjustment ranges for the downhaul and outhaul are smaller. As the breeze gets up, I use progressively more vang as the Mark II is definitely harder work to windward than the Mark I. Comparing notes with Doug after Race 4 at Vallarta when the breeze built to maybe 18 knots, he was working his sheet from block to block to about 15 cm whilst I was operating from about 15 cm to 30 cm (US sailors still using archaic feet and inches will have to do their own conversion!). The next Laser Master Worlds will be contested at Split, Croatia in September 2017. I have cruised the Croatian coast from Pula in the north to Dubrovnik in the south and Split is the pick of it – it should be an outstanding venue, combining Croatian history, culture and cuisine with great sailing conditions. Be there! Great post - thanks to both you and Mark.